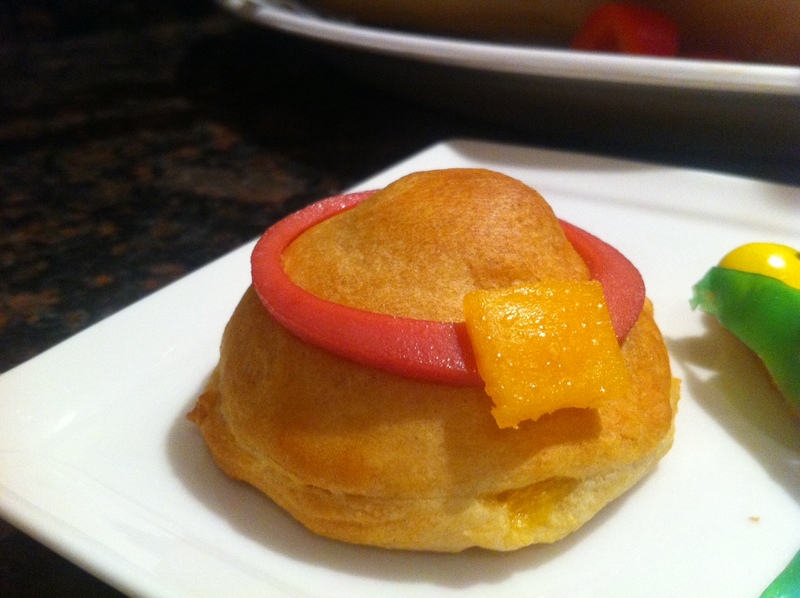 Looking for a fun appetizer with a Thanksgiving flare, why not try Pigs in the blanket the Thanksgiving way. You can prepare those in a flash, or even do them with the children. They are so easy to make. Ingredients for about 10 hats: 1 box of crescent roll, 1 pack of hot-dog, 1 pack of sharp cheddar cheese sliced, barbecue sauce, bologna. Materials: 1 perforated sheet, 1 silpat, 1 plastic brush, round cookie cutters of 2 inches and 1 3/4 inches. Roll the dough out, flatten it out, and press the seams together. With a cookie cutter of 2 inches, cut out circles. Spread the barbecue sauce on each of those circles. Then with the 1 3/4 cutter, cut out circles of cheese and place them on every other circles. Cut the hot-dog into 3/4 inches and have them stand out on the middle of the circle. Take one of the circle , spread it out a bit and cover the hot-dog. Pinch the sides of the dough to make sure that the cheese will not run as the pilgrim hats cook. Cook in a warm oven of 375 for 12 minutes. With the cutters, cut out cylinders into the bologna to create the rim of the hat. Then cut a very small square of cheese to make it look like the buckle of the hat. Et voila!